Between 2004 and 2006, a dozen of the best artists were each given 48 pages of almost total creative freedom. Any genre, any style, any DC character, any wholly original idea all their own was possible. Within this massive tome you’ll not only find several great Batman short stories, but a vast range of other equally unforgettable tales as well that will remind you just how great comic books can be. With so many talented people coming together to do what they love you end up with a book that radiates passion and, as a result, is almost impossible to set down. When every 4 or 5 pages leads into another story in another genre featuring an even more unique artistic style you say to yourself “I probably have time for one more story.” before going to work or catching up on sleep, but there you’ll be one hour later still devouring quality fiction and even some non-fiction. You didn’t like the previous short-story? The next one will likely be more your speed. Not a fan of the pencils on this page? The look won’t be the same in just another flip of the paper. SOLO is nothing if not a beacon of variety! Clearly, since I’m reporting on it for a site called Batman News, there are obviously plenty of Batman stories to choose from, but this volume collects so much more than that! Yes, there are supeheroes such as Superman (Loeb and Sale deliver a touching scene that would fit perfectly in their Superman: For All Seasons), Hourman (there’s a really funny story about Hourman trying to find something, anything to do for the next 59 minutes after finding nobody in need of saving), Teen Titans, The Question, The Spectre (if you liked the animated short from 2010, you’ll love this), Doom Patrol, The Flash, Cassie Cain, Stephanie Brown, and others, but the genres go beyond capes and cowls. There’s an assortment of fine Westerns, detective stories featuring the likes of Slam Bradley, espionage tales, romances, personal anecdotes (these can be regarding anything from how the artist broke into comics, their artistic process, a touching flashback to how they fell in love with drawing, or the time they thought they caused the death of Young Frankenstein‘s Marty Feldman), and much, much more. Some of my personal favorites were by MAD Magazine’s Sergio Aragones, who writes with so much heart and illustrates some of the funniest and even the most poignant pieces in this anthology. Other favorites include a romantic affair by Darwyn Cooke about a man and his love for his brand new vacuum cleaner (can’t say I’ll forget this one anytime soon), Howard Chaykin’s WWII short about a black jazz musician trying to escape Nazi occupied France, a cursed tomb from Richard Corben’s imagination, and, well, if I kept listing all of the stories I loved we’d be here all day! 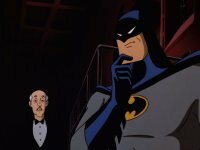 I suppose the things I should discuss the most are the various Batman shorts. Much like the rest of the stories in this extremely large graphic novel, no two Batman stories are alike. Some keep things traditional and modern day while others get nostalgic (just look at the Batusi cover) or abstract and downright psychedelic. The greatest strength of SOLO is its depth. SOLO shows us everything comics have to offer and because of that it’s now my #1 go-to book when it comes to introducing non-comics fans to this exciting medium. I firmly believe that those who never gave comics a chance and even thumbed their noses at them will discover the literary and artistic value comics are capable of when they read SOLO. It might not be a superhero story, it might not be a comedic yarn– it might not even come until they’re halfway finished with the collection, but I wholeheartedly believe there will be something here that will ignite a passion for reading that they never knew they had. Even with all of that content there is still room for supplemental material! The last 30 pages or so are dedicated to giving each of the twelve great artists a full biography accompanied by several pages of original sketches. Had this book included no bonus material whatsoever I wouldn’t have even batted an eye since there’s so much book there already, so getting these extras was a genuine treat. Yes, even at $49.99 I totally think that this is worth full price– not that you’ll need to pay that with Amazon currently offering it for around $35 bucks! It has over 560 deluxe-sized pages featuring short stories from almost every genre written and illustrated by the best talent in the business. It’s immensely re-readable, the perfect book to lend to a friend, it will likley take you a few days to finish it all because there’s just so much of it, and, let’s face it, that giant cover showcasing Batman doing the Batusi will look great on your shelf! SOLO has it all. Batman stories (dark, light, funny, modern, and retro varieties), westerns, science fiction, espionage, romance, fantasy, horror, historical tales, autobiographical accounts, and some of the most imaginative and gorgeous artwork you’ll ever find in a comic. I give it my highest recommendation and say it’s a must-buy for anyone who loves comics!